I had the chance to see an old PBS special, The Botany of Desire, while doing mundane tasks over the weekend. It’s based on Michael Pollan‘s book of the same name – although he’s since become more famous for his The Omnivore’s Dilemma: A Natural History of Four Meals . Pollan crafts interesting questions, and then carefully gathers scientific information to answer them. In The Botany of Desire, he looks at the domestication of plants from the plants’ point of view. 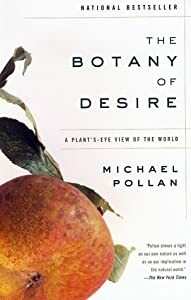 While he certainly doesn’t presume that the plants are conscious, nonetheless, he looks at the ways plants give things to humans – beauty, sweetness, forgetfulness, control – as ways of succeeding in the plant world, gaining new territory and spreading their genes far and wide. The four plants featured had remote beginnings in Central Asia and South America, yet are now grown around the world. Pollan’s work not only provides an intriguing view of the plants’ world – it helps us regard some of our own agricultural choices in a new light. The Botany of Desire can be streamed for instant viewing over Netflix.